Best thing for drying delicate glassware - no spots. 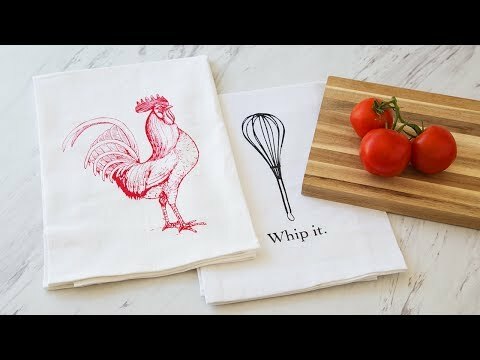 I love dish towels and these are so appealing that I gave 1 as a gift, I have 1 in the usage rotation, and I use the other as decor. They are exactly what I have looked and looked for. The right size, the right material. Great! 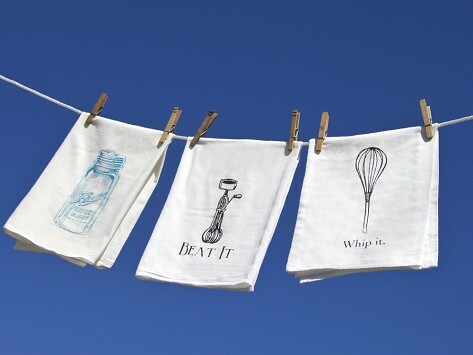 Love these towels! I use them to dry dishes and they work very well. I bought the red Christmas words one and the goat one for other times of the year. Good purchase! These towels are unique! I love them!! Reminds me of a old fashioned kitchen. I will display them on my oven handle. Good quality! I ordered these as gifts. When they arrived, I loved them so much I went back and ordered several more for both of my daughters and as many for myself!! These have that great texture of the flour sack material and take me waay back to when my grandmother bought her flour in these sacks and shirts, etc were made from the material. She bought them in prints and patterns as well. Thanks again Grommet for a great find!!! I am very pleased with these towels, soft & a great size . Have not used them since they are Christmas gifts for others. May order some for myself now. I would like 2 of each, but would have to buy a bigger house! This are cute, well-made and clever. Plus absorbant, of course. Love them.